It visualizes the various amount of electric power such as household power generation systems, midnight power equipment, EV • PHEV and circuit branch up to 36 circuit. It is also available in a wide range of energy monitoring at home by measuring utility such as gas and water. This product is unitized for each function to make it possible to select model as needed and to provide economical measure considering housing size and the equipment spec. 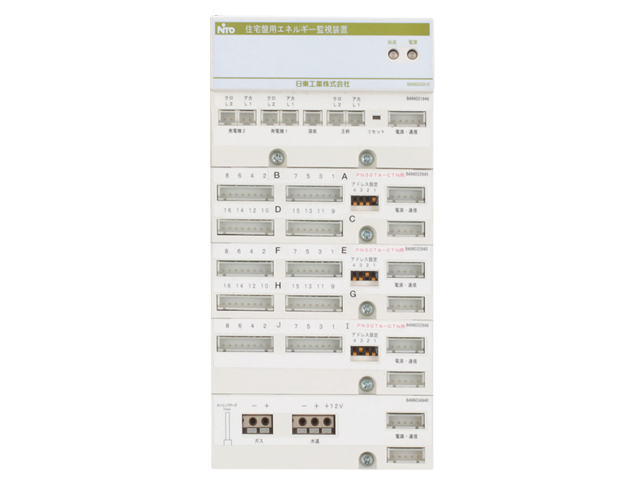 Extra residential distribution board, wireless LAN (Wi-Fi) access points and HEMS controller are required because this device transmits the measured value to the upper level of the HEMS controller. This product is self-management for energy-saving purposes. It is not instrument applying to specific measurement provided by Measurement Law. Therefore, it is not appropriate to be used as purposes of certificating power amount or billing.